To make your home renovation plan a success aesthetically and financially, it is always a good idea to do some quick calculations in advance. After all, if you are going to invest additional money in your home beyond the principal you pay with each mortgage payment, you want to make sure it will provide a sufficient return on investment should you later decide to sell your home. You will need to budget for your home improvement project, but before you do, you need to consider which renovations will yield the best returns. Let’s take a look at how best to plan a renovation, as well as what steps to take when planning a budget. The renovations that tend to possess the best ROI for your home are typically kitchen, finished basement, and attic projects, as these account for nearly 10-15 percent of the overall value of your home. Bathroom renovations come in second place at 5-15 percent of your property value, though half baths and powder rooms typically contribute even less. Based on these percentages, you should plan your renovation based first on your satisfaction and which project provides the most additional property value as secondary consideration if you plan on remaining in your home long term. However, if you intend to sell your home at a future point in time to relocate for a new career or retirement, you should put the ROI of your renovation project at the top of your priorities list since increasing value is far more important if you plan on selling in the future. The most renovated area of any home is the kitchen, and 40 percent of all money spent on home renovation in the past decade has been for kitchen renovations alone. With no sign of this trend slowing, the average amount spent usually comes to just under $30,000 with new flooring, cabinetry, lighting, appliances, countertops, and the labor for installation. Provided you are not changing the footprint of your kitchen of course, which can cost significantly more. The biggest cost for home improvement projects is the skilled labor cost of having an expert do all of the work on your home renovation. That being said, if you are feeling brave, you can handle some of the low-skill labor yourself. Remember, making a mistake can cost more to fix than hiring a pro in the first place. Often it pays off to let a skilled expert take care of home renovations to ensure they are done correctly. A lot can go wrong with certain aspects of home renovation, and it is often best left to experts. Use laminate or composite countertops rather than hardwood, granite, or marble. 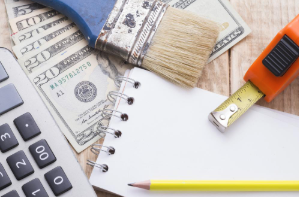 Once you have established what you want, how much it will cost, and how much labor you can invest yourself, it’s time to start a goal account in your budget and begin saving to avoid financing costs for your renovation. After all, every dollar you pay in interest on your renovation is adding to the overall cost and reducing your ROI. The other advantage of a goal account to save for your project is that it will take time to put that money away, and you will be able to bargain shop for items a little bit at a time as you go after careful consideration. When buying on credit, it is very difficult to resist the temptation to purchase the first item you like that comes along. The most important factor to keep in mind though is that the bigger the project, the more time you will need to save up the funds in your goal account. Start cutting costs in your overall household budget sooner rather than later. Turn down the thermostat in the winter and up in the summer. Don’t spend money on things that are not necessities, and hold off on any long-term investments like a new car. The more money you can allocate to saving for your renovations from your household budget, the better. All in all, your home is one of the most significant investments that you will make in your lifetime, and investing in renovating your home to increase its value and your enjoyment of living there both for both your financial and personal well-being. Save your money up and be smart about spending, and in no time you will be ready to install that dream kitchen or bathroom flooring you have always wanted.